The Gallbladder Meridian connects with the Liver Channel, with which it is externally-internally related. Based on traditional Chinese medicine, the relationship of the liver and gallbladder is extremely close. 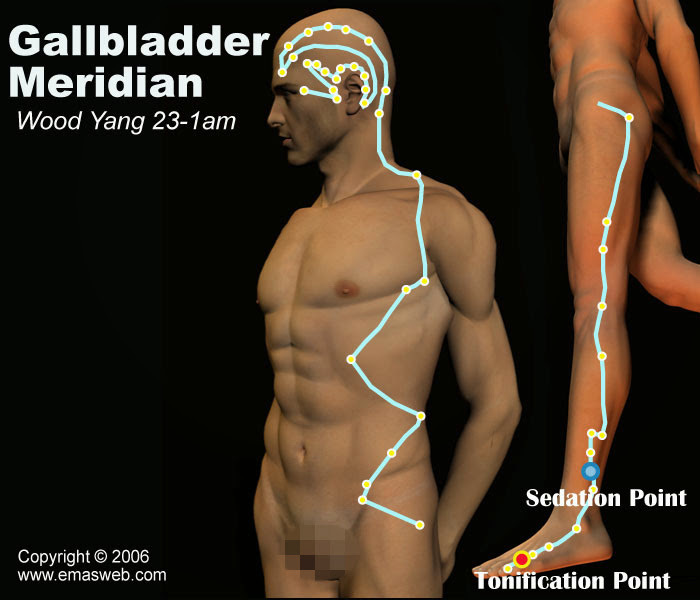 Abnormalities of the Gallbladder Meridian will result in bitter taste in the mouth, vertigo, headaches, and migraines. In addition, pain in the chest, hips, lower limbs, and below the armpits all may result from abnormalities in the Gallbladder Meridian. Abnormality of circulation in the Gallbladder Meridian may also lead to vertigo, eyes without spirit, bitter taste in the mouth, or a gray and dull complexion. Peak qi and blood flow in the Gallbladder Meridian is from 11:00 pm until 1:00 am, midnight. 1.Pain in the lateral costal region, diseases of the liver and gallbladder. 3.Diseases of the nervous system. 4.Diseases of the side of the head. 5.Diseases of the eyes, ears, and throat. 6.Diseases along the course of the Gallbladder Meridian.